Many years ago, when I asked my dear Grandma Freydl, how to make blintzes, those delicious Jewish crepes filled with creamy cheese and topped with fruit, she told me that to make them, you went to the freezer case, bought them, and heated them up at home. Blintzes have an unjustified reputation for being difficult to make, but they are not hard at all. If you’re making a large number of them (I’ve made 200 at a time) for a party, it takes time to make all the crepes and fill them (enlisting a couple of friends and relatives to create a production line is helpful), but the process is straightforward: you make small crepes out of a thin batter, cook them on one side, fill them with a cottage cheese mixture on the cooked side, and then fold them and cook the outside. 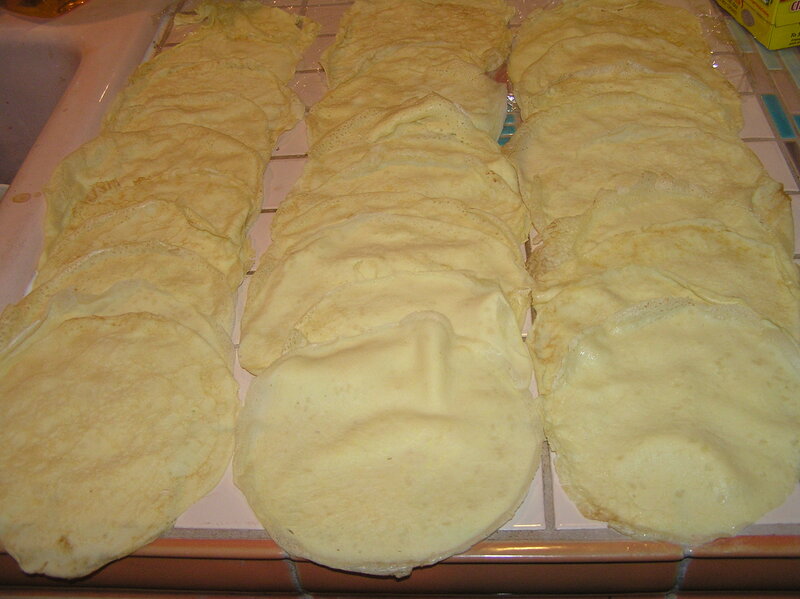 Some time after I learned there was a means to obtain blintzes outside of the freezer case, I discovered that it was easy to make them very low fat by substituting non-fat ingredients for higher fat ones – thus eliminating blintzes’ reputation for being a high fat luxury. This time I even baked them instead of sautéing them in butter, both further lowering the fat and allowing me to make a large number (40) at once. Blintzes are also versatile. They freeze well at the point when you’ve filled them but not done the second cooking, allowing you to make them well ahead of an event. Just defrost them before cooking. They make a good brunch dish, and have significant Wow factor if you bring them to a potluck, as I did this time – especially since people think they’re so hard to make. You can vary the toppings. Many people serve them with sour cream and sweetened strawberries. I’ve had them with apples cooked in cinnamon, and various melted preserves. The Blueberry-Cinnamon Sauce is simple, and any leftover sauce is great on French toast or pancakes. In a medium bowl, beat batter ingredients to form a thin batter. Spray a small frying pan with cooking spray and heat over medium heat. Pour 2-3 tablespoons of batter into the frying pan, turning quickly so that the batter covers the whole bottom of the pan, making a thin crepe. Cook until the crepe is golden brown on the bottom. Be sure not to overcook so the crepe doesn’t get too stiff, or it will be hard to fold. Remove the crepe from the pan, and set aside, raw side up. Don’t be concerned if the first crepe or so is a bit ragged. It takes a while to get the knack of making them. Besides, they don’t have to be perfectly round since you’re going to fold them. I prefer to make all my crepes at once, and then fill them. You can line your counter with plastic wrap or wax paper and overlap the cooked crepes…if you’re making a lot it becomes a blintz factory. You will probably have to re-spray the pan about every third crepe. This is the blintz factory. Mix filling ingredients ( cottage cheese through cinnamon) in a medium bowl. Place crepe on a flat surfaace cooked side up. 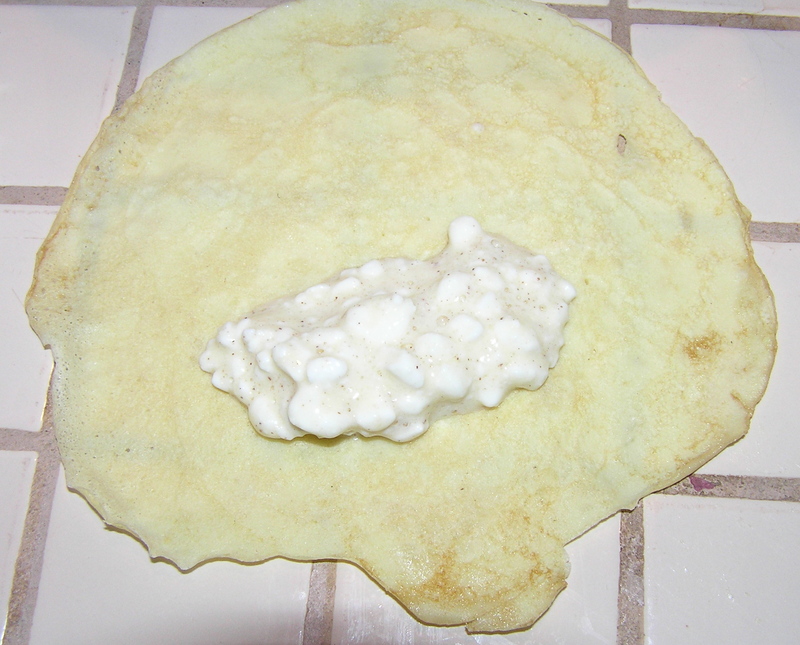 Place a small quantity of filling in the center of the lower third of the crepe. Note that this crepe is not very round. Perfection isn’t all that important here. Fold crepe over filling, then fold the sides in, and continue to roll the crepe up. You now have a blintz. Place blintz seam side down and set aside. If you are going to freeze the blintzes, this is the time to do it. Be sure to put plastic wrap between the layers of the blintzes you’re freezing so they don’t stick together. There are two ways to cook the blintzes. (If the blintzes are frozen, defrost them before this step.) You can either melt one tablespoon of butter in a frying pan and cook the blintzes over medium low heat, starting with the seam side down and turning once when the bottom side is golden brown. Or you can put the blintzes, seam side down, on a baking sheet or pan coated with cooking spray, and brush the tops with the melted butter. Bake at 375 for 40 minutes, or until golden brown. 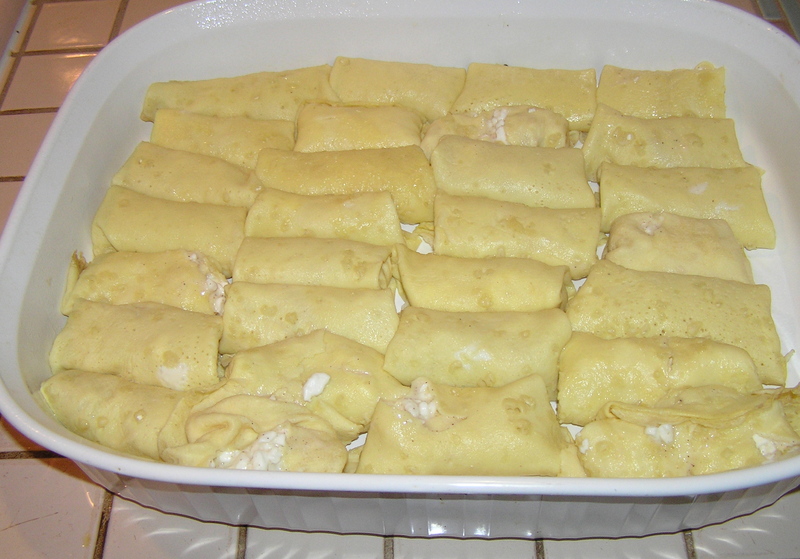 Some of the blintzes have little tears where the filling shows through These won’t matter once they are cooked. This makes about 10 blintzes at about 1.6 grams of fat/blintz. NOTE: This recipe is a bit imprecise because a lot depends on the size of the pan you make your crepes in. Mine makes about 10 blintzes per recipe. Also, if you double, triple, or otherwise increase the recipe, be aware that it makes more filling than you need for the number of blintzes you are creating. I usually make 3 recipes of crepe batter to 2 recipes of filling, but I often have leftover filling even then. Cook blueberries, sugar, cinnamon, and 1/4 cup water over medium heat until blueberries are soft, mashing gently with a fork or potato masher occasionally as they cook. When berries are soft, mix one tablespoon cornstarch with 2 tablespoons of water. Sir into the blueberry mixture and stir until the mixture thickens slightly. 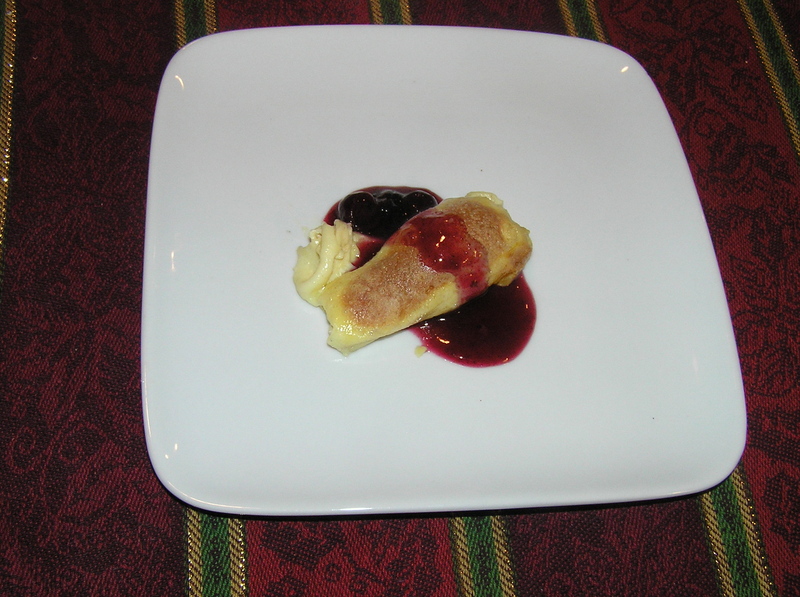 This was a blintz that unraveled a bit, so I didn’t take it to the potluck. I ate it right then. We picked the rest of the plums, the ones that were too high in the tree to reach from the ground. Unfortunately, the little sugar bees had discovered the split plums and the tree was full of them. In order to avoid getting stung, we whacked the tree with a stick and picked up the plums as they fell to the ground. There are a lot of plums. Two buckets full. While we were whacking the tree and causing plums to rain down, a mother deer and her still spotted fawn stood in the field about 200 feet away and watched us. She knew exactly what we were doing. I expect she is the orphan fawn that lived in the brush beside the fruit trees last year. She knows all about plums, since I always throw the bird pecked fruit on the ground.. When we walked away from the tree and stood a few feet away talking, mother and fawn crept up and began eating the leftover plums. My friend went back to get the stick he had used, and she ran off about 50 feet away and stood and screamed at him until we went inside. Preheat oven to 375°. Coat a 10-inch deep-dish pie plate or a 7 ½ x 11 baking dish with cooking spray. Place plums in bottom of dish. Lightly spoon flour into dry measuring cups; level with a knife. Combine flour, sugar, salt, and cinnamon, in a bowl. Gradually add half of milk, stirring with a whisk. Stir in remaining milk, fat free half and half, rind, egg and egg substitute. Pour batter over plums. Bake at 375° for 1 hour or until set; cool. This is one of those dishes that puffs up to the top of the dish, and then caves in as it cools. This make 6 servings at one gram of fat/serving. The weather folks predicted temperatures in the 50’s by the end of last week, with breathless commentary on the coming of Spring . Within a few days they had revised that to the 40’s, with some nights dropping into the teens. Now it is snowing quite vigorously – giant fluffy flakes that are, in theory, pretty. The weather folks are hyperventilating about beating the all time local winter snow record, which is only 4 inches away. Whoopee!! I am hyperventilating about the need to drive and walk on icy roads. This Blueberry Brunch Casserole appeared in American Profile, one of those magazine inserts that come in your local paper. It is very good, warm, and filling. It is, however, mediocre at being reheated at half speed in the microwave. I think it is best eaten mostly the same day, although I am reheating leftovers for breakfast, which are ok but not as good as the same day. The advantage of this dish is that you can make it the night before (or several hours before), refrigerate it, and bake it in the morning when you need it. The original recipe called for 2 cups of blueberries, with one incorporated and one cup sprinkled over it after baking. I really didn’t need the garnish effect, so I increased the blueberries that were incorporated to 1½ cups. It also called for serving it with fat free whipped topping, but in my mind that makes it a dessert (blueberry bread pudding? ), which might be ok. Besides, I never eat whipped topping, although I have been thinking about measuring out some real whipped cream to top it one evening. Coat a 13 x 9-inch glass baking pan with cooking spray (I used my ceramic pan – I don’t have a glass pan of that size.). Whisk egg substitute (or whites) and eggs in a large bowl until well beaten. Add milk, yogurt and sugar; mix well. Add bread cubes and toss to coat completely. Add cream cheese and blueberries and toss to blend. Pour egg mixture into pan. Cover with plastic wrap, and refrigerate at least 1 hour or overnight. Preheat oven to 350F. Remove plastic wrap and bake 50 to 55 minutes, until a knife inserted in the center comes out clean. Remove from oven and let stand 15 minutes. Makes 8 servings at 3 grams of fat/serving. Does not appear to make it stop snowing. HINT: If you’re using frozen blueberries (which I did), rinse and drain well on paper towels before adding to egg mixture. NOTE: The original recipe called for 2 cups of 2% milk, but the only milk I ever have in the house is non-fat milk. Whenever a recipe calls for something other than non-fat milk, I mix the milk with fat free half and half and it seems to work. You can use 2 cups of 2% milk; it adds about .5 grams of fat/serving. Due to the snow, we didn’t have Christmas morning. No one could get here. Now, there’s still snow on the ground, but the road and driveway are clear, so we decided to have Christmas yesterday (what’s a few weeks between friends). Every Christmas, after we open the presents, I make mountains of these pancakes for our Christmas morning breakfast, accompanied by hot chocolate or coffee depending on your preference. They are different than regular pancakes because they are not cakey. They don’t absorb a lot of the maple syrup, and have a distinct tang because of the cottage cheese. I don’t remember where I first saw the recipe – I remember it had six tablespoons of butter, but I modified the original to make them low fat. To be honest, I no longer measure when I make them, so the recipe may take a little more flour to make the batter right. Melt one tablespoon of the butter and allow to cool slightly. Mix the cottage cheese and egg substitute in a large bowl. Add the melted butter and stir well. Add the flour and stir well until incorporated. This batter should not be runny, but should be like regular pancake batter – you may need to add more flour a tablespoon at a time to get it to the right consistency. Spray a non-stick griddle pan with cooking spray. Heat over medium heat. When the pan is hot, use a pair of tongs to hold the remaining tablespoon of butter and use a bit of the butter to lightly grease the pan. Re-grease it between batches. (You can make these with only cooking spray to grease the pan. They are a bit lower in fat, but they lose some of flavor). Spoon by about ¼ cup measure onto pan. 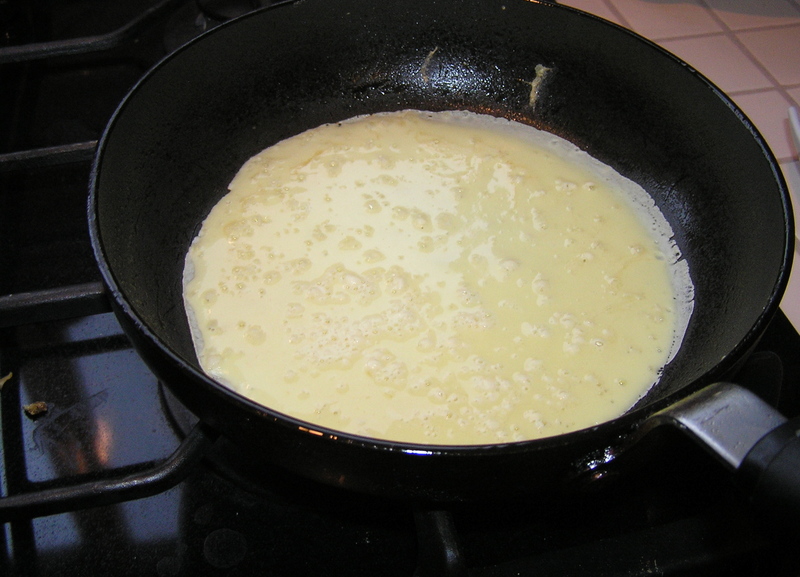 Cook until the underside of the pancake are golden brown; turn and cook the other side. You can keep these warm on a plate in a low temperature oven while you make subsequent batches. This makes about 16 pancakes, with a serving of 4 pancakes having about 5.5 grams of fat/serving. Serve with your favorite syrup. Personal Aside: The pan in the photo is known in our family as “the WestBend”. Once a long time ago it made fried chicken and other such items. Now it only comes out to make these pancakes. The rest of the year it lies buried in the bottom of the pantry. But “break out the WestBend” means Christmas here. It is the dog days of summer, although I don’t know why any dog with a big fur coat would enjoy temperatures in the 90 degree range. I am too tired to really cook, so I made breakfast for dinner. With blueberries, naturally. I didn’t really even make a real blueberry sauce to go over the pancakes – just tossed some blueberries and real maple syrup in a pot to simmer while I made the pancakes. It’s a really basic pancake recipe, similar to one that was printed in the Wellness Newsletter, and is about as easy as making them from a box, and a lot healthier. In a large bowl, whisk together flours, baking powder and soda. Stir in egg whites, canola oil, and buttermilk until the dry ingredients are just incorporated. Stir in blueberries. *Flours absorb liquids differently, so the amount of buttermilk you need depends on your individual flour. Stir in 1 1/2 cups of buttermilk and see if the batter is thin enough (flows easily off a spoon). Add more if it needs to be thinner. I also found that the batter thickened up as I cooked each batch, so I had to add a little more buttermilk half way through. Coat a non-stick griddle pan with cooking spray and heat over medium heat until a drop of water sprinkled on the griddle sizzles away instantly. Pour 1/4 cup of batter on the griddle for each pancake and lower the heat a bit. You know when to turn the pancakes over when little air bubbles appear on the top surface. Cook for 2-3 minutes on the other side. This made 16 pancakes, with a 4 pancake serving having about 5.25 grams of fat. Buckwheat pancakes don’t photograph well, no matter what color plate you put them on. The buckwheat makes them kind of grey – in this case grey with purple berry splotches. But they taste good. The item next to the pancakes (soaking in blueberry syrup) is Garrett County Farms Uncured Turkey Bacon. It is the best turkey bacon I have eaten, all natural turkey raised without antibiotics, all natural Ingredients – no nitrites, nitrates or preservatives. I got it at Costco. It gets reasonably crisp and has only one gram of fat/slice. Karen’s big dog not enjoying the dog days, although he did enjoy his pancake.